Trinity is offhandedly known to be a milder version of a Tsundere while all the while being brutally honest (or just plain honest), social when she needs to, and daring. Because of how she acts outwardly she tends to get into trouble with people, mostly in the sense them not being able to handle her intimidating presence. But nonetheless she’s a wonderful comrade to have and a frightening enemy. Along with that, Trin is also pretty competitive and enjoys competing against other Campers--but at the same time knows how to understand you will win or lose (which probably comes from the fact she’s Nemesis’ child) and often goes by the theory of balance. But with that in mind that will not go easy in what she does and rather it makes her more passionate in what she does. In the end Trinity hides a lot of the soft side she possesses. Taking what she feels for a weakness. So from that she rarely shows how really kind she is. 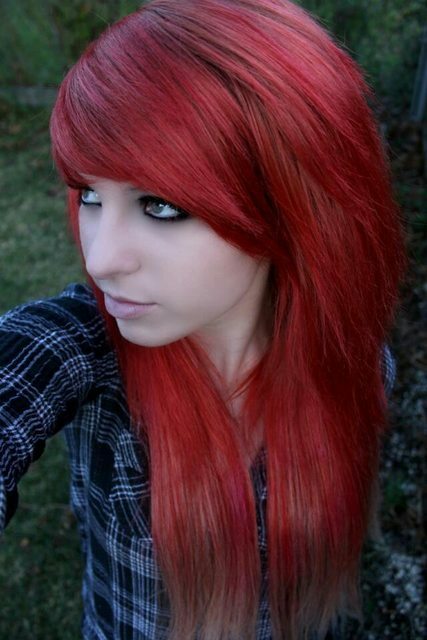 She dyes her hair red. Trinity was born in West Virginia. She lived in a decent sized house with just her and a father, Nathan Siever, who worked as a lawyer. She never got to meet or know her mother; all she knew was that she had left them. Trin wasn’t very good in school, considering she had ADHD and was Dyslexic thanks to being a demigod, which made her father very unhappy with her and usually he would ground her or disown her for not “trying hard enough”. Trin nonetheless was a very lively kid and played a lot of sports with the neighborhood boys. Like all half-bloods, Trinity saw monsters since she could remember. She had an issue being outside alone or even being by herself at all. From this she began to develop paranoia that she still suffers from today when she’s in a room alone. After some time when she reached the age of 12, Trinity was taken to CHB by a Satyr named Reed. She only left a note before she left, letting her father know she was going away for a while and would be back one day. Trin has yet to contact her father since then. Daring, not afraid to take chances. Knows how to use weapons/her powers. Has a temper that can blind her at times. Her powers are very limited. When left alone for long periods of time she gets Paranoia. However, it's not as bad as it used to be. Oh and she's Straight thought I'd put that down here.